We need to empower computers with their own means of gathering information […] without the limitations of human-entered data. Case in point, the badge: the surname and given name are reversed, with the latter mispelled misspelled as a result of human data entry during onsite registration from a paper & pencil form. Nonetheless, this is an excellent example for emphasising the potential of RFID and the IoT! Indeed, at the co-hosted IEEE RFID event, I, Jeffery Jeffrey, presented a workshop entitled Co-located RFID Systems Unite! focused on this potential now that there are nearly 20 billion RAIN (passive) and BLE (active) units shipping annually. An open architecture for collecting, contextualising and distributing the resulting data is becoming critical, and I was pleased to hear this sentiment echoed on the RFID Journal side by Richard Haig of Herman Kay and Joachim Wilkens of C&A. Also heard echoed was the prevalence of BLE (active RFID) throughout the conference. Literally. This contraption which converts radio decodings into musical notes may seem odd at first, but over the past year we’ve learned that art is a powerful tool for conveying to a non-technical audience the prevalence and potential of RFID and IoT in our daily lives. A few attendees were invited to listen with headphones and walk around until they found a silent spot. None were successful. And we can only expect such prevalence to increase with energy harvesting technology maturing. We were pleased to see Wiliot’s live demo of an energy harvesting BLE tag, making good on their objectives from last year’s conference. Inexpensive battery-free BLE will be key to RFID proliferating to all the physical spaces in which we live, work and play—the BLE receiver infrastructure is often already there. Which came first: the RFID or the Digital Twin? Ironically, our April Fool’s post from two days previous was about Digital Conjoined Twins where we joked that the digital twin resides in the optimal location: adjacent to the physical entity that it represents. Perhaps not so silly in the context of industrial applications highly sensitive to latency??? RFID projects championed by the organisation’s finance department? While we’ve observed our fair share of tech-driven deployments over the past few years, we’re increasingly seeing measurable business outcomes. For instance, a recent workplace occupancy deployment delivered, within months, a 15% savings in real-estate. That is a business project—one the finance department would love to repeat! What will we discuss in our RFID Journal Live 2029 blog post when the IoT celebrates its third decade? That may well be in the hands of the next generation. Since we began attending the co-hosted IEEE RFID and RFID Journal Live in 2013, we’ve observed a slow but steady shift in demographics. A younger generation—one which grew up with the Internet—is succeeding the generation instrumental in the development and commercialisation of RFID. On the showroom floor, we’re talking about the Web and APIs. At the IEEE dinner we’re discussing industry-academia collaboration to teach students about applications and ethics. And in the IEEE workshops, ASU Prof. Katina Michael took the initiative to invite one of her undergraduate students to argue the (highly controversial) case for implantables, effectively ceding centre stage to the next generation. 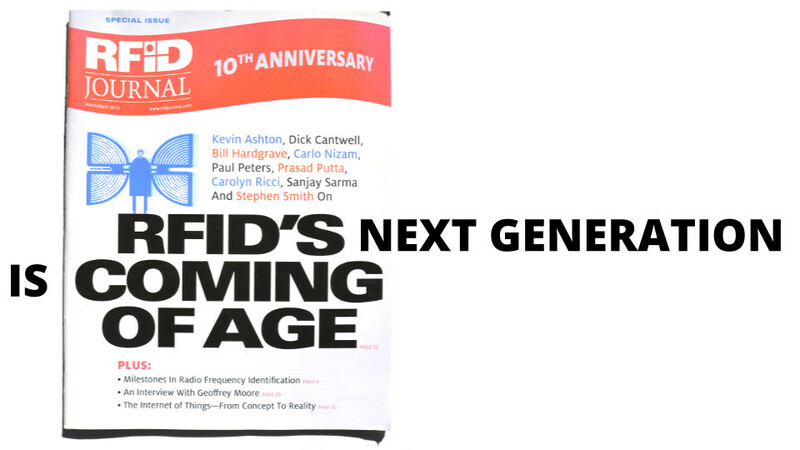 The final print copy of RFID Journal we received back in 2012 is entitled “RFID’s Coming of Age”. Today I would argue that RFID’s next generation is coming of age. 1999 saw the emergence of the terms IoT and Web 2.0. 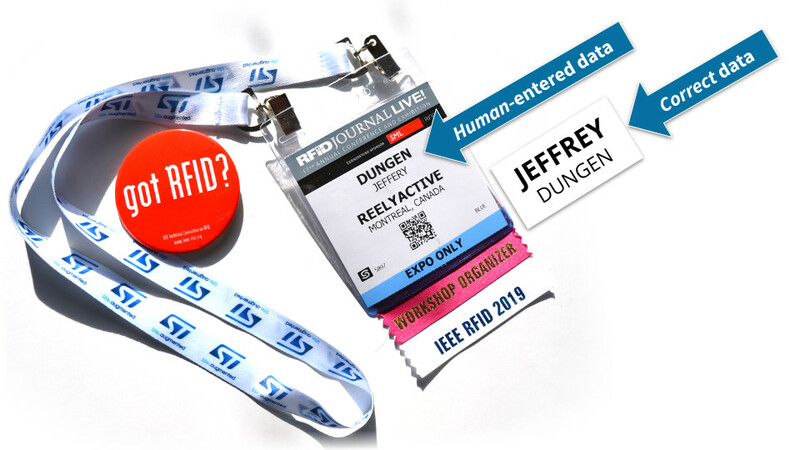 Might we expect 2019 to mark the emergence of the term RFID 2.0? Five years ago, reelyActive attended its first RFID Journal Live conference. Back then, we had pioneered simple, accessible cloud-connected active RFID. It’s easy to forget that in 2013 Bluetooth Low Energy (BLE) had not yet established itself as the de facto standard for active RFID, nor had the RAIN RFID alliance been formalised. This past week we were back in Orlando for the industry’s largest event, now as world-leaders in BYOD RTLS. And for those like us who haven’t given up on the dream of pervasive RFID, of Kevin Ashton’s Internet of Things, and of ubiquitous machine-contextual awareness, there’s plenty to be excited about in the coming years! What if the mobile phone in your pocket — and your connected appliances at home — could automatically recognise the consumer packaged goods (CPG) you own and use? That’s just one of many potential applications when Wiliot‘s batteryless Bluetooth Low Energy (BLE) chip hits the market. By harvesting the 2.4GHz energy emitted by nearby WiFi & Bluetooth devices, and even microwave ovens, this chip will transmit periodic identification/status messages over a range of first meters, then, in a second generation, tens of meters. Imagine the product lifecycle of, for instance, a sofa with this embedded chip. Its transit from factory to showroom is easily tracked and optimised. Not only can it be located in real-time on the showroom floor, shoppers can effortlessly retrieve information about the product on their smartphones. The connected home automatically recognises the sofa from delivery to disposal [enter your favourite smart home use cases here]. And, upon disposal, the material contents of the sofa can be automatically retrieved from the web, optimising recycling and reuse. Never once in that process was there a battery to change/charge. Technology such as this will be a key driver of the pervasive sharing economy (just add couch-surfing to the sofa example). And our platform is ready to recognise Wiliot’s chips and relay their messages the moment they hit the market. What if every product existed on the web, accessible via a standard web address? Pick up an item close to you right now and you’ll almost certainly find it has one or more identifiers (bar code, serial number, etc.). For instance, I was pleasantly surprised to find that a pair of jeans I purchased at an Orlando outlet was EPC/RFID-tagged — but its bar code number 50001231818 is meaningless to me (and even to Google)! So, how does one connect product identifiers to the web? We finally had the opportunity to physically meet EVRYTHNG, a startup we’ve been following online since the earliest days of the IoT hype cycle. 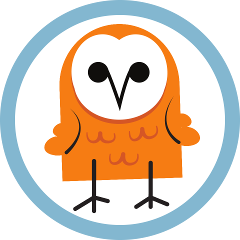 And it was outstanding to learn that not only will their standardisation efforts with GS1 wrap up in the coming months, but OEMs can already link their products today: one code, one web address. Ourselves having focused over the past few years on the plethora of BLE devices and their identifiers, in 2016 we created Sniffypedia which serves a similar purpose (and provides our competitive edge in BYOD). It is exciting to see how today the EVRYTHNG platform has evolved to make the digitisation of products accessible to the average business/OEM. As a result, not only will more products exist on the web, actually finding them on the web via their physical code — or in our case via radio-identifiers — will be straightforward thanks to this new translation standard. What if real-time inventory were as simple as pointing a light at the shelf/rack? A few months ago we were delighted to share Light hears ahead of its time. A few days ago we were delighted to find that commercial lighting systems are also integrating long-range passive RFID readers! 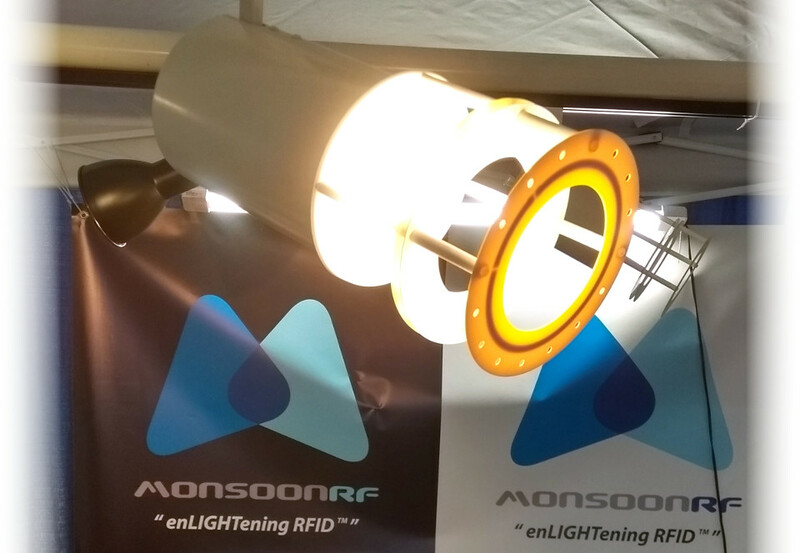 Charles from MonsoonRF showed us how their track light could simply be pointed at a wall of tags to enable real-time visibility and inventory. The collected data is shared over WiFi. How many engineers does it take to screw in a lightbulb? The answer may very well be none, and if so, that’s a major leap forward for pervasive passive RFID infrastructure. Imagine setting up a retail store for real-time inventory simply by pointing lights wherever items are on display! In 2018, we can expect to see prototypes of consumer packaged goods that can be identified almost anywhere and anytime, a definitive standard for translating such identifiers into web addresses, and the early adoption of lighting infrastructure to detect and locate the billions (eventually trillions) of radio-identifiable items common in our daily lives. Back in 2013 we were convinced this would happen, although we didn’t know exactly when or how. The fact that it is happening validates the purpose of our Pareto platform: converting the radio packets from any device (BYOD) captured by any infrastructure (BYOI) into a real-time contextual event data feed which embraces the standards of the web and can be distributed to all concerned parties. In other words, to observe the real-world like the web. for those like us who haven’t given up on the dream … there’s plenty to be excited about in the coming years!